There is a perpetual debate that exists as to whether margarine or butter, is the better choice to use as an essential ingredient when preparing food. Therefore, it is worthwhile to examine the differences between the two products. The primary issue that exists with butter is that in spite of its easy digestibility and the vitamins that it contains, it comprises largely of dietary cholesterol as well as saturated fat, which are the worst substances that can be consumed by those of us who are trying to manage our cholesterol. This occurs because it is an animal-based product, rather than margarine, which is plant-based. Studies have shown that an individual of good health should only have an intake of 200mg of cholesterol each day – there is 33mg of cholesterol in a tablespoon of butter. Excess cholesterol, as well as the large amount of saturated fat, is a double-edged sword and has the potential to create or worsen a heart condition; two tablespoons of butter is already over the recommended daily intake. From the above, it can be deduced that butter contains too much cholesterol and saturated fat and it is because of this that Flora has produced a range of margarines that have a far lower percentage of fat (and much less saturated fat). Margarine is made from vegetable oil instead of the animal fat that is found in butter. 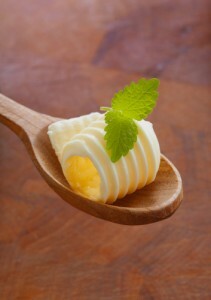 Flora offers four different types of margarine that ranges from 65% to 35% of fat – far less saturated fat than butter. There have been other studies that suggest that either option is alright as long as it is used in moderation, but what we can reason is that if you are trying to manage your cholesterol and are following a low-calorie diet, margarine is your best choice. Flora products are now available online for your convenience. Visit Flora’s official website for all the details.